Here we lay some ground rules for writing the ideal thank-you letter to a customer, with a few suggestions to make it extra special. Why Should You Send a Thank-You Letter? A successful customer thank-you letter increases the possibility of building strong relationships with customers, which has a positive impact on satisfaction, loyalty and engagement. These strong relationships also help in terms of encouraging customers to give feedback, as well as increasing the likelihood of the customer doing more business with the company. 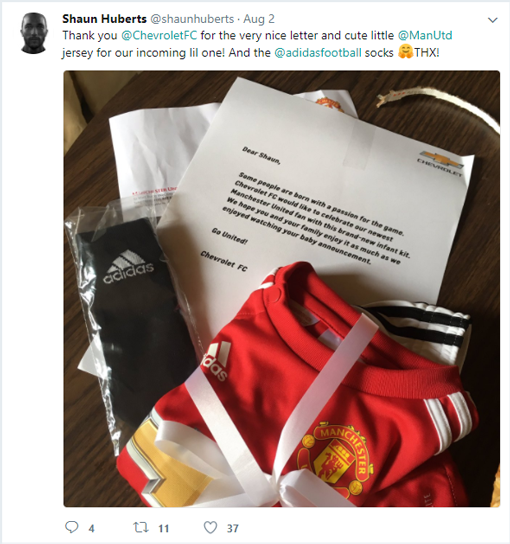 The customer may also choose to share their thank-you letter on social media, which can generate good publicity and brand awareness. Here is a to-do list when writing a customer thank-you letter, before an example of how all the components blend together into a fluent piece. Many companies are putting a lot of effort into personalisation, so the customer experience feels “tailor-made”. Addressing the customer by their first name in a letter helps to do this, as it shows that the organisation has not simply followed a template, i.e. Dear Mr [INSERT SURNAME]. Also, sending a thank-you letter implies that the customer already has a relationship with the organisation. So using the customer’s first name helps to acknowledge that you recognise their engagement and/or loyalty. Thank-you letters should not be sent at random, as they are best used after the customer has given you some business, completed a survey or as a special gesture when a customer gets involved in something for the benefit of the organisation, e.g. a customer focus group. 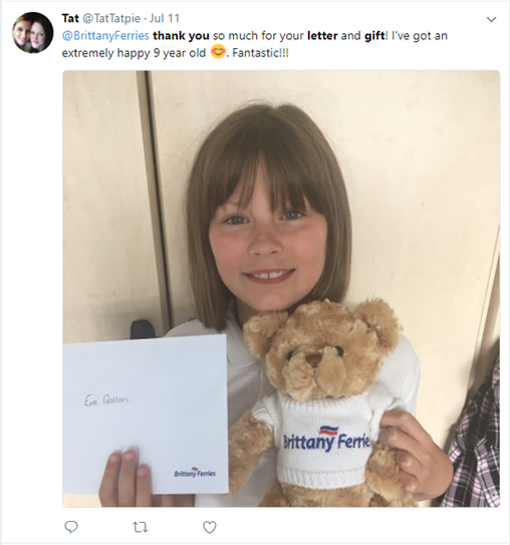 By sending thank-you letters at these moments, the organisation is again personalising the letter, proving that they care about the customer’s business and their relationship. So, single the customer out and include the reason for sending the thank-you letter in the opening paragraph to remove the generic “thank you for being a customer” sentiment. Also, if the customer is being thanked for their feedback (or something of that nature), it may be a good idea to include what will be done with that feedback, to demonstrate that their time is valued. Although a thank-you letter is an expression of gratitude, the organisation should not assume that they have fully expressed their appreciation by simply sending the letter. The worst mistake that a company can make is to write a short thank-you sentence and then fill the remaining white space with promotional content. The letter should repeat the thank you, to emphasise that this is its main priority. Explaining why the letter has been sent and giving an expression of gratitude will only take a couple of paragraphs at most, and the last thing the customer wants to see is promotional content “filling-up” the remainder of the page. But whoever signs off the letter should include their contact details. This is so the customer feels as though they have a “personal insider” within the company who they can contact with their problems. 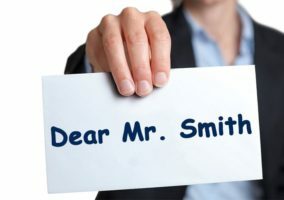 Another possible addition to the letter could be a sentence or two expressing a personal wish that the customer is happy with the organisation’s product or service. 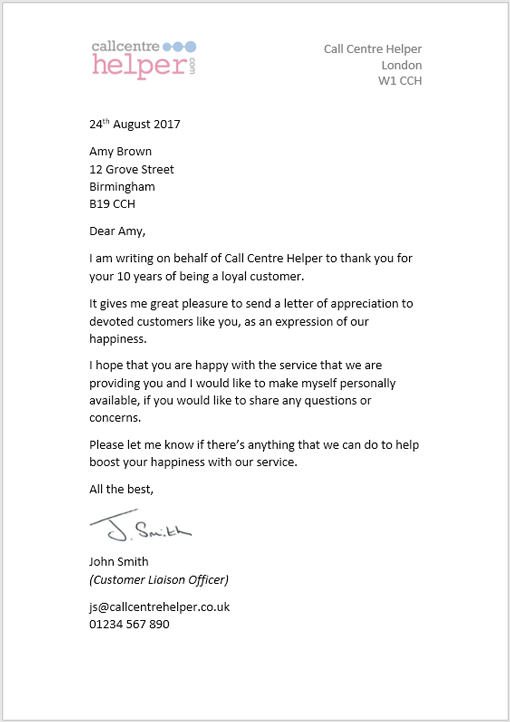 The tone of a thank-you letter should be in keeping with the established relationship that the organisation has with the customer. 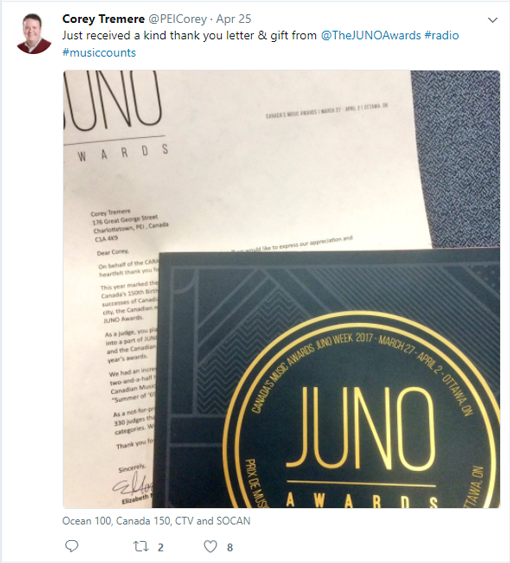 So, nothing too formal when sending a thank-you letter to a customer of 20 years, for example. This means that closing statements such as “yours sincerely”, or worse, “yours faithfully”, should be avoided. Instead, “thanks again”, “all the best” or “warm regards” could be used as suitable replacements. A logo and/or a swift reference to the organisation that is sending the letter is needed so the customer is fully aware who has sent the message, but nothing more is necessary. This is a good principle to stick to, as the customer will likely lose interest in the letter if it starts to turn into a sales pitch or becomes a narrative of the company’s history, values, etc. Instead, the letter should be written in first person to highlight that someone is personally involved and interested in the customer as an individual. No matter how well the thank-you letter is written, the customer will more than likely hold suspicions that a template has been used, especially if the letter is typed. 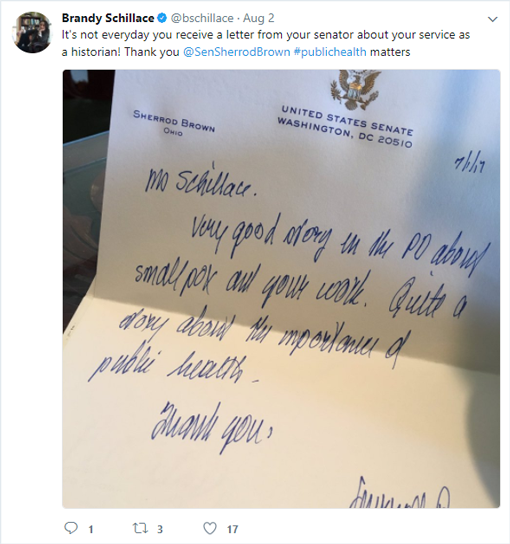 So, to show that more effort has been put into the customer’s letter than just inserting the name and the date into a template, a handwritten signature can be a nice touch. But, to go the extra mile, the organisation can write the entire letter by hand, as discussed below. Below is an example of how all the points noted above can merge together to form a thank-you letter that is ideal for sending to a customer. To create memorable experiences, customer service teams are often asked to go the extra mile. The same sentiment should apply to the thank-you letter. 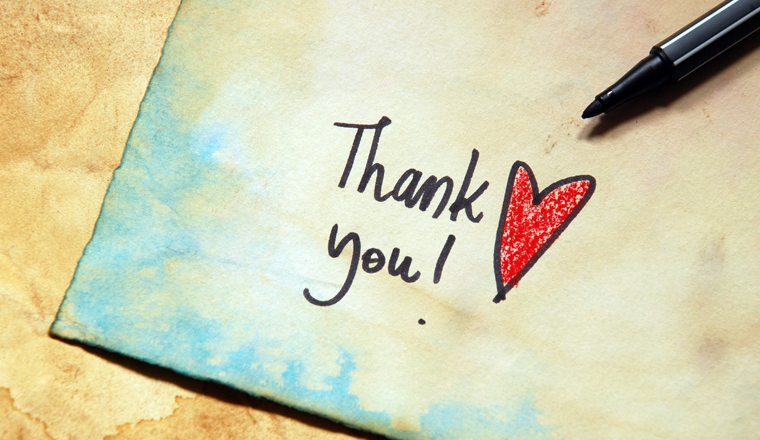 So, here are three ways that a thank-you letter can be specialised to leave a lasting impression on the customer. Customers not only want you to value their time but appreciate time being spent on them. It communicates to them that the company cares. So, taking the time to handwrite the letter demonstrates that time, effort and consideration has been put into each word, removing the dreaded template “feel”. It is best not to worry about the quality of the handwriting, as long as it is legible, because bad handwriting may add to the “realness” of the situation. Everyone likes a free gift, whether it is a company pen or something larger, and for special customers this might be the perfect partner to the letter. This is best done by sending something small but representative of the business, as, in most cases, it is safe to assume that if they have done business before, the customer is interested in the products or services that the organisation offers. Or the company could send a gift that is unconnected to their business, especially if it is an organisation that sells life or home essentials but is of a professional nature. Below are a few examples of gifts that accompanied thank-you letters that have gone down well with customers. Thank-you letters are a method of distinguishing one business from another, and, if it fits the brand image, use of emoticons may help an organisation differentiate itself further. Also, organisations can target their use of emoticons to certain segments of their customer base. If an organisation has segmented their customer base into certain personas, it can assess how each persona would likely react to the use of emoticons, e.g. whether a persona would share the humour of using emoticons or feel alienated by their use. Then the organisation can decide whether to use emoticons in a letter to that persona or not. Also, if the letter is handwritten, doodles could be used, again if it matches brand image and/or the customer’s personality. Do you agree with our advice? Or is there anything else that you would recommend doing?